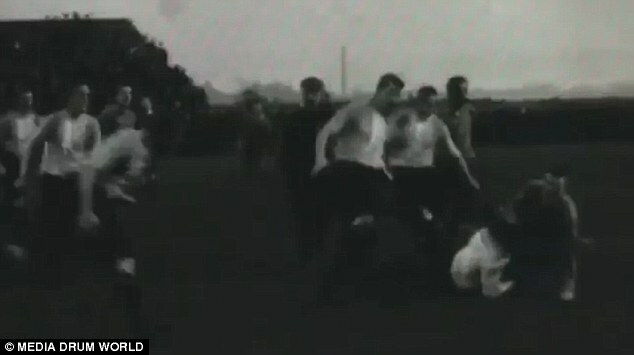 Fascinating footage from more than a hundred years ago, believed to be the first ever game of rugby caught on film, has resurfaced ahead of the final week of the 2018 Six Nations. The video, which is just under a minute in length, shows a 1901 fixture between Yorkshire sides Dewsbury and Manningham as they go head to head at the former's Crown Flatt ground, which is still home to the town's Rugby League team to this day. The clips reveal that the game is not so different to the sport as it is today, with a number of bone-jarring tackles going in from each side and tricky wingers attempting to make sprints down the touchline. 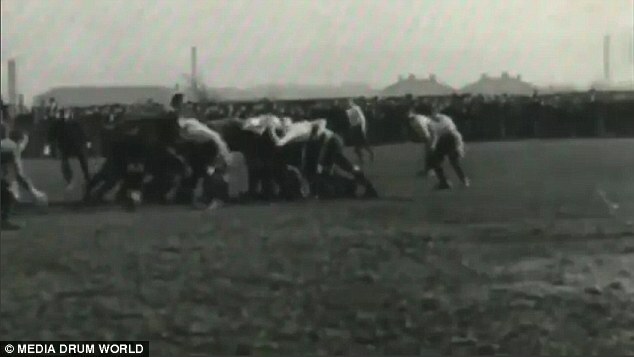 Fascinating footage from more than a hundred years ago, believed to be the first ever game of rugby caught on film, has resurfaced ahead of today's final week of the 2018 Six Nations. One player can even be seen with his shirt almost completely ripped from his torso as the gathered crowd excitedly cheer on at the drama unfolding before them. Bradford-based Manningham originally played under the Rugby Football Union (RFU) but soon after became a founding member of the Northern Rugby Football Union, better known today as the Rugby Football League (RFL). Manningham won the inaugural Northern Rugby Football Union competition in 1896, but the club's existence was to be short lived. Following a meeting in early 1903 between James Whyte, a sub-editor at the Bradford Observer, and a Football Association (FA) representative at Manningham's Valley Parade ground to discuss establishing a Football League club in the city, it was decided that Manningham would cease to be a rugby club and switch to association football. This new club was to be called Bradford City A.F.C. 'The Bantams' still play in the English Football League at Valley Parade to this day, and include well known Sky Sports pundits Chris Kamara and Peter Beagrie among their alumni as well as recently-fired manager Stuart McCall, a former Scotland international who lead the club to the Premier League as captain in 1999 in what was Bradford City's first top flight campaign for 77 years. More recently Bradford City shocked football fans across the country when they made it to the League Cup final at Wembley in 2013, becoming the first ever fourth tier side to reach a major cup final at the home of English football. They defeated three Premier League sides in Wigan Athletic, Arsenal and Aston Villa on their run to the final before finally succumbing to Swansea City in a 5-0 loss. 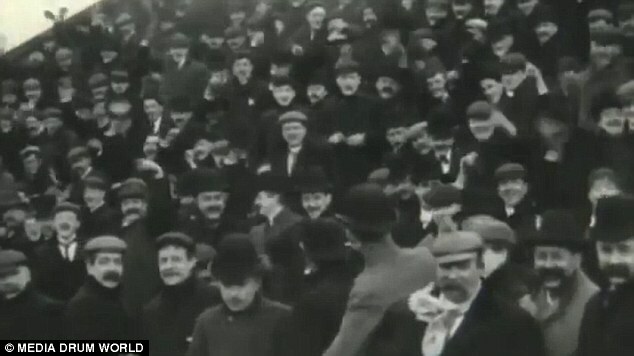 The 1901 footage was produced by pioneering Edwardian film company Mitchell & Kenyon, based in nearby Blackburn. After a discovery of hoards of film negatives in 1994, the Mitchell & Kenyon collection is now the largest surviving collection of early non-fiction films in the world. 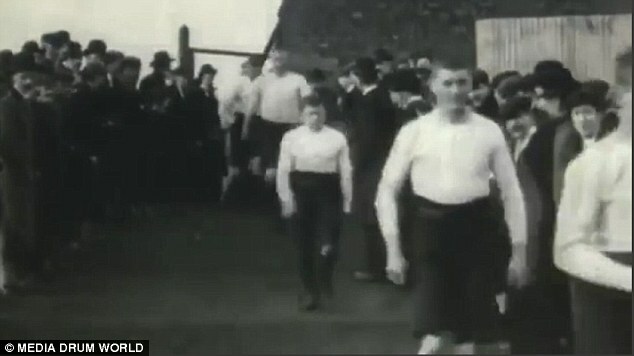 Among their other notable sporting works is the first known film of the newly renamed Manchester United, playing against Burnley in December 1902. Last edited by Blackleaf; Mar 18th, 2018 at 08:17 AM.. It's nice that they don't play with an old chopped off colonial head anymore. A human head is the wrong shape to be a rugby ball. Have you ever played Blackie, and I do mean a match where anyone was a gentlemen in any sense of the word? I played a bit of rugby at school. There's an old saying which goes: "Football is a gentleman's game played by hooligans, rugby is a hooligan's game played by gentlemen and cricket is a gentlemen's game played by gentlemen." And, coming from the North of England, where rugby league is most popular in the British Isles, I prefer rugby league to rugby union. Rugby league, like football, is a working class sport, whereas rugby union, most popular in the British Isles in the South of England, Wales, Scotland and both Irelands, is more of a posh middle class sport. Rugby league is faster, more intensive, and has less stoppages in play. Rugby union is more stop-start and far too technical.